Reluctantly we left the Soldotna area. The red fishing on the Kenai was only going to get better in the next two weeks but we had reservations and plans in Anchorage, Denali and beyond. So off to Anchorage we went, rain was forecasted for the day as well as the next few days to come. The cloud cover was low and true to the forecast it rained all the way to Anchorage. The rain, however, was a welcome sight to the firefighters battling a blaze in the Turnagain Arm area. The road was closed temporarily then open with pilot cars but when we went through we only saw smoke and the vehicles of the firefighters. Arriving in Anchorage we went directly to our favorite campground in the area; Cabela’s! We actually got by pretty cheap this time as although we walked the store a couple of time we did not buy anything. I do have my eye on a new pistol however…..
Anchorage was going to be a stopover on our way to Talkeetna and Denali. The original plan was to stock up with groceries and do laundry. That changed a few weeks ago when our friends Tom and Shelly from Minnesota said they were going on an Alaskan vacation and were going to be in Anchorage on the 22nd and 23rd! Now add dinner with good friends to our agenda. There were three restaurants that we had considered going to last time we were in town and this time we were determined to hit at least one of them. Emailing Tom, I offered up three restaurants; Moose's Tooth Pub & Pizzeria, Glacier Brewhouse and Orso. He wanted steak or seafood so we made reservations for Orso. Laundry and grocery shopping done Barb and I headed to Moose's Tooth for a late lunch. We had heard about this restaurant from Barb’s cousin as they are well known for their pizza. She did not lead us astray as the pizza and beer were excellent. I would highly recommend this place! The following day it rained most of the day so we lazed around and read until it was time to meet Tom and Shelly. There is no real convenient parking in the restaurant area, especially if you have a 26’ camper/truck combo but we did find several pay lots that we fit in for $10/4 hours. The dinner and company were excellent. We had not seen Tom and Shelly since last fall when we were in Minnesota. After dinner we wandered over to Humpy’s for a beer before we said goodbye and went our separate ways. After spending another night at Cabela’s we headed north towards Wasilla. We had heard that the Hatcher Pass road was a must drive and looked forward to the slow but scenic drive. But, the rain foiled our plans again. What we could see was pretty but visibility was very poor. This roadside pull out offered "Sweeping views" of the valley below. Isn't it beautiful? We made it to the visitors center near the top but decided to turn around and take the blacktop back down rather than drive the 27 mile gravel road down the other side of the pass. On the way to Talkeetna we stopped and checked out a few rivers and streams for fishing. Montana Creek had silvers, pink and chum salmon running but the fish were congregated in a very small area and so many fishermen were there that it was nearly impossible to fish them so we just watched for a while and headed back to the truck on our journey to Talkeetna. We were sidetracked once again when we saw the sign for Denali Brewing Company where we HAD to stop and sample a flight of some their brews! We spent the night just outside of Talkeetna at a roadside pull out. Probably the quietest spot we have stayed at in weeks. Not a sound, it was almost too quiet! The town of Talkeetna itself is very cute. It is obviously a tourist town but not to the extent of Skagway where it is over the top touristy. Talkeetna is touristy with a lot of charm. Daisy had a great time walking the town but was somewhat of a camera hog wanting to get her picture taken at every stop throughout the day! Is there a bear behind me? Wish there was some snow! That afternoon we spent the day slowly traveling towards Denali stopping at various streams seeing if there was any fishing opportunities. At one in particular we saw both salmon and trout so we got out the flyrods and gave it a try. Soon enough I hooked into the biggest salmon of my life, a 20+# king salmon. It was an epic battle between man and fish. Well not really, although the fish knew it was hooked, it really did not care. It sat in the middle of the river while I tried to reel him to shore. He would not budge! I jumped in the stream and crossed over to a gravel bar and tried to beach him. I would get him close to the bar then with a swish of his tail he was back in the middle. I got him close a couple of more times but back out to the middle he went. Got him on, jumped in with shoes and all! Then swish, back to the middle! This went on for about 15 minutes until he decided he was done playing this game and headed downstream. I tried stopping him but in the end the fish was victorious. He actually bent my hook straight when he got off! It was a blast! What was left of my hook! We spent the night at a rest area at mile marker 185 on the Parks Highway. It was an old campground that allows free camping now complete with picnic tables and fire grates. Gotta love these free sites! In fact since returning from Kodiak we have stayed at free sites every night. 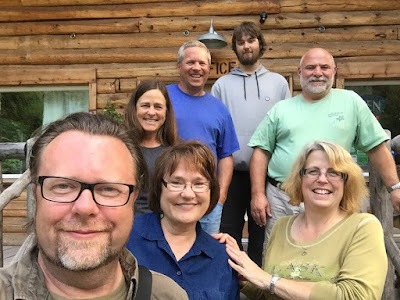 All of which (except Rich and Susan’s driveway) would have fit rigs of any size; Fred Myer in Soldotna, 2 nights at a roadside pullout 56 miles outside of Soldotna along the Kenai River, the quiet pullout on the Talkeetna Spur Highway and the wayside rest mentioned above. Saving money on campground just means more money for fishing and breweries along our journey! Next up, a week at Denali National Park! My Crappiest Day of Fishing EVER!!!! I have had some crappy days of fishing but I doubt I will ever top July 15th as my crappiest day of fishing ever. Or I should say I hope I will never top it. It was bound to happen sooner or later as we were having an incredible run when it came to fishing. After leaving Whittier we made our way back down the Sterling Highway. Back towards our new friends Rich and Susan’s house in Ninilchik for the third time in the past month. This was not on our original plan but Rich and Susan kept extending invitations saying the fishing only got better as the month went on. How could we refuse? Typically the fish run about the same time from year to year so when Rich said that the run usually peaks near the 25th we were kinda bummed as we had were not going to be anywhere near the Kenai at that time! But as luck would have it the numbers this year are almost double what they were last year and really started climbing on July 11th. So back to Ninilchik we went camping in their driveway for another 3 days. Their son Billy had arrived a few days before and their other daughter Sandra arrived the night before we left so we were able to meet and spend at least a little bit of time with the entire Ross gang. What a great family! In the end the fishing had not picked up as much as we hoped. We got out on the river one day with Billy, Susan and Angela (Rich stayed home and painted the deck). It was as crowded as we had seen the river but fishing was very slow. In fact this was our first day on the Kenai that we actually failed to catch a fish! The following day we went out on the Cook Inlet in their boat for a short whale watching excursion. I say short because the sea got a little rough and we had to turn back and head for the marina. I did not say anything at the time but I was somewhat happy that Rich turned around when he did as I was starting to get a little green around the gills! Despite the waves we did see a few whales, we would often see a flock of gulls diving in the distance meaning there was probably a whale feeding nearby. The waves made them much more difficult to photograph but we managed to get a few descent shots. A whale tail going under! We would look for flocks of gulls diving and usually there was a whale near by. That evening Barb and I drove over to Deep Creek Recreation Area where our friends Steve and Linda were camping. They had a great spot within feet of the water and incredible views. We had a great visit but of course forgot to bring the camera. The next morning we sadly said goodbye to our friends the Ross', we hope to catch up with them this coming winter somewhere in California however! Thanks for everything!!!!!! But back to the reason for the title of this post……On our way back to Ninilchik from Whittier we decided to stop and fish the Kenai up near Cooper Landing near the Russian River. We found a nice little pull off with a trail down to the river but found the water moving much too fast and the water too deep to wade in. So we moved the truck downriver a few more miles to another pull off and after a little searching found a nice little eddy where the water pooled and slowed down. It looked like the perfect place to fish. The only exception was that the water was 5-10 feet deep, the bank was a few feet above the river and there was really only room for one of us to fish effectively. But these downsides were quickly outweighed as I could see dozens of salmon resting in these backwaters! I ran back to the truck and got Barb. It was going to be a good day of fishing! So we got our gear together and headed back. My goal was to see Barb hook into a few salmon so I sat back while she flipped into the eddy. The seagulls and eagles were flying overhead with cloudy skies and sprinkling rain now and then. Soon enough she hooked into one and it was jumping like crazy! As it made its way to the faster current in the river it rocketed downriver, jumping along the way. She was doing everything she could to stop it but this fish was determined and had the momentum of the river helping it. We watched helplessly as the fish spooled line from her reel. Fly reels have enough fly line on them for most fishing situations, that is followed by a less quality line near the spool called “Backing”. If we did not get this fish stopped all her line would spool out and we would be left with nothing but an empty reel and out about $50 in line. Well this fish has spooled all her flyline and we well into her backing and not slowing down. Finally with just a few feet of backing left I grabbed the rod and stopped the line from spooling and broke the fish off. There was no way we were going to stop that fish but at least we did not lose all our line. As I was reeling in the line I looked over at Barb she was holding her wrist. If you are not careful you can whack your wrist on the reel handle when fish are spooling you like that…..you guessed it, she whacked her wrist not once but several times while trying to stop that fish. Soon it swelled up and it looked like someone stuck a ½ a golf ball under her skin! Another nice fish for Barb! Although sore, she wanted to keep on fishing had her best day fishing on the river hooking fish after fish. She was able to keep most of them out of the current and lost a few others that managed to get out there. I had a great time watching her smiling, laughing and netting her fish for her. After a couple of hours she said that she was tired of reeling in all those fish and I wanted to try! It had starting sprinkling a little harder but nothing we could not handle. I took my spot at the edge of the eddy and started flipping. Flip after flip, I could not catch a fish! Maybe it was not going to be my day. All of a sudden I was totally drenched! No, I did not fall in the water…. No, it did not all of a sudden downpour…… it took me a second to figure it all out but when I looked up there was a seagull flying away with a smirk on his face. I had been shatted on! Pretty much covered from head to toe in seagull shat! Fishless and dejected I called it and day and headed to the camper for a shower…..
All was not lost though as I redeemed myself the following morning while Barb’s was less than perfect. Since Barb was not going to fish she didn’t bother to wear her waders. We returned to the same spot and I hooked into a nice one. Barb quickly grabbed the net. The fish was being a bugger and refused to come anywhere near that net. Every time I would get it near, Barb would try and scoop it up and it would make a run for it. Finally I got it close to the bank, Barb leaned over to net the fish and…..down goes Barbie! Next thing we knew she was in 5 feet of water totally drenched. I don’t know who was more shocked, me, Barb or the salmon she managed to net on the way in! Barb and I had been looking forward to this week for a very long time. We only had two planned visits with friends while in Alaska (ends up we had many more) and this week was going to be our second! Several weeks ago we had stopped and visited Lee and Trace in Glenallen and this week we got to see Bill and Kelly outside of Seward. We had met both of these fine couples our first year on the road in Florida at the 2015 RV Dreams Boondocking Rally. We caught up again with them last winter in Arizona and now we were seeing them in Alaska. Just goes to show you how geographically RV’ers can meet up pretty much anywhere! Bill and Kelly are workamping at Renfro’s Lakeside Retreat for the summer. A cool place that offers both RV sites as well as cabins. We had been in contact with them and let them know we would be bringing plenty of halibut and salmon and planned to make them dinner our first night in. As luck would have it Steve and Linda were also going to be in the area and could stop by! We had met Steve and Linda for the first time on our way to Florida in the spring of 2015 as well. Their son Zach was visiting as well, we all had a great dinner and caught up on our travels since we last saw each other. The next day Bill and Kelly had to work so Barb and I drove the 20 miles to Seward and explored the town. This town rivals Skagway when it comes to picturesque scenery. Everywhere you looks were rugged snow covered peaks. On our way there, we took a detour to see Exit Glacier and so that Barb could get her National Parks Passport Book stamped! We toured the visitor center and took a short walk to see the actual glacier. Along the way, there were signs with years on them which showed where the glacier was at that point in time. It’s amazing how far the glacier receded in the late 1800’s to early 1900’s. I overheard one woman say it was because of global warming. I wanted to ask her what was causing global warming between 1890 and 1930 in this remote unpopulated area. We explored the shops in town, the brewery, the marina and even visited the Sea Life Center. It is a great little town, if I had to knock it for one thing it is the parking. Very little free parking almost everywhere you went you had to pay $10/day for parking. We found free parking on the outer edge of town at the town park. This guys was lucky he was behind glass! A helicopter? Someone has too much money! We also found some great boondocking spots outside of town along Exit Glacier Road. There are spots up and down the road right along the river that could accommodate any size rig. Not only was it free but you could not beat the views! Our site for the night with a view! The following day Barb and Kelly had booked a dog sledding adventure with Seavey’s Ididaride Dogsled Tours. Luckily for them there were only two other people on their tour. Funny thing, one of them Barb said did not like dogs! For $69 each you got to have an informational session with one of the racers talking about training the dogs for the Iditarod race and the race itself, meet some of the dogs, go on a 2 mile dogcart ride, hold the puppies and get to try on their winter gear and sit in one of their dog sleds. It was VERY noisy when all the dogs started barking at once! Barb all ready for racing! Both said it was a great time and well worth the money. We then said goodbye to Bill and Kelly and headed off to Whittier. It was a pretty drive with several glaciers along the way. This is by far the weirdest town we have been to so far. First, the only way to get there by road is to take a 2 ½ mile tunnel. This tunnel is only about 20’ wide and only allows one way traffic at a time. If you want to go into town you line up outside the tunnel (after paying $13 roundtrip fee) and on the bottom of each hour they allow traffic into the tunnel. On the top of each hour they allow outgoing traffic. Oh did I mention that it is also a railroad tunnel too? Not sure when they allow the trains through (I think it is at night). Talk about getting the most out of a tunnel! The drive in was actually pretty cool, we have never been in a tunnel that long. Exiting the tunnel we drove into town, next thing we knew we were on the other side of town at the ferry terminal. I am guessing from the end of the tunnel to the end of town was maybe 2 miles. We hit the end of town, turned around, looked at each other and said this is it? This is the town? Yup that was the town. But wait it gets weirder! There are approximately 240 fulltime residents in Whittier and we did not see one house. Where do all these people live? Well most of them live in an old military building now renovated into housing. Over 2/3rds of the residents live in this building which is also home to the City Offices and Police Department. The remainder of the residents live in another military building. There is room for expansion however as there is another shell of a military building near the other one. As Kelly recently said, you could film a Walking Dead episode in that building! A cute town, a scenic town, a quiet town, but definitely a weird town in our opinion. Next up more fishing adventures as we return once again to the Homer/Ninilchik area to see our friends Rich and Susan and see how those Kenai River Reds are running! Fun with Friends in Homer!